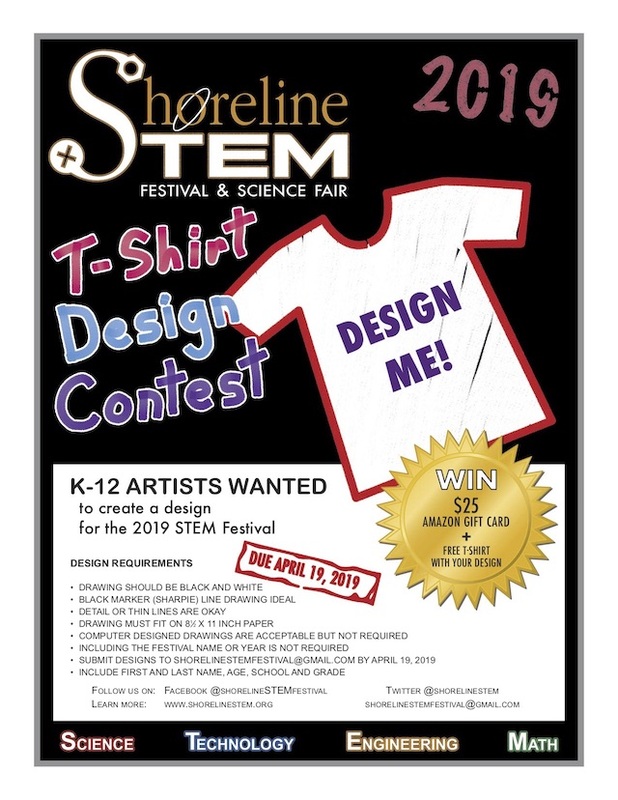 Student artists are invited to design the T-shirt for the 2019 Shoreline STEM Festival and Science Fair (STEM= Science, Technology, Engineering, and Math), which will take place on June 1, 2019 at Shoreline Community College, with a K-12 student science fair, hands-on STEM fun, and robotics demonstrations! All students who enter a science fair project will receive a free t-shirt with the selected design. Registration for the science fair and entrance to the festival are also all completely FREE. Submit a scan or photo of drawings in black ink on standard 8 ½ x 11 inch white paper to shorelinestemfestival@gmail.com. Include your name, grade and school. Deadline for entries is Friday, April 19. The artist with the selected design will receive a free festival t-shirt and a $25 gift card from Amazon.com! Shoreline STEM is an all-volunteer 501(c3) nonprofit dedicated to supporting extended learning opportunities in science, technology, engineering and math for students in Shoreline and Lake Forest Park. We need your help to make the 2019 festival happen. Check out the “How can I help?” page on our website for more information.